Discreet and Comfortable Protection made for a Man. 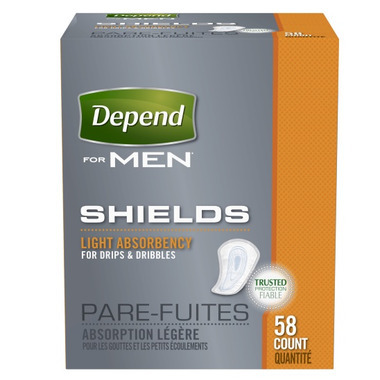 Depend® Shields for Men provide light absorbency for drips and dribbles of wetness. Shields are ultra-thin absorbent and shaped to fit a man’s body. A strong adhesive locks the shield into your own close fitting underwear. Each shield comes individually wrapped in a discreet-to-carry package. Why choose Depend® Brand products? Super absorbent polymers draw wetness in, away from the skin, helping lock in urine and odors while helping to keep skin dry. All Depend® Brand Products are latex-free and contain no lotions or fragrances.